Once upon a time people lived their lives by what the stars told them. 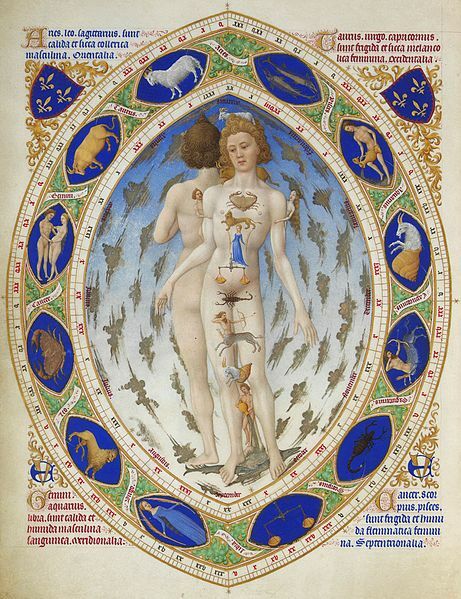 It is not so long ago that doctors would consult their astrological charts before making big decisions. It is said that the law required physicians across Europe to consult the position of the moon before doing anything too ambitious, like blood-letting or surgery. And every planet was ruled by a sign. When the planet moved near its ruler things were thought most propitious. And still when, for a laugh, we turn to the stars page of one of the British tabloid, we are advised to act boldly when such a happy coincidence takes place. I have had two fairly rocky years. Not rocky like most people have rocky; but with veins of unhappiness running close in with the ever-present contentment. I have always thought that happiness is like a puddle: it is not a blanket. Even in the worst day something can happen which will make one, for an instant, happy. And there are times when the happy pools are bigger, and there are times when they are smaller, and there are times when they disappear and life is barren. And the secret of happiness is noticing the tiny pools even on the blackest day. Those black days, I suppose the planet must be perceived as being far, far away from its ruler, and one should steer clear of hospitals and leeches. But the converse is also true. Occasionally, the geometry of one’s life must lead to points where almost every event might make one happy; where planet and ruler appraise each other affably. Where God smiles and says, take a load off, why don’t you. And he was right. Because much as one would love to freeze a propitious moment, one simply can’t. One must just revel in it and gather strength for the next chapter. There’s that fantastic episode from the Biblical gospels: Jesus takes all his mates up a mountain. You could stop it right there: I love mountains. There above the world, away from the hubbub of life, one’s perspective changes. Happiness permeates because in the face of the majesty of nature you just want to gawp and be part of creation. Jesus’s right hand man, Peter, has a suggestion. Why go back down, he says? Why not just pitch some tents and stay here forever? Me, I’d have weighed in with Peter. Let happiness last forever. Because everyone has to come down. There’s mankind to save, down the mountain. And pain, and derision, and death and resurrection, if you believe the stories. But I am up my mountain right now. I’m sizing up my Creator to see if he will let me pitch a tent. These are pictures of my new workplace. Ah Kate, how beautiful, poignant and mascara-smudgingly awesome. I’d love to get my hands on that one, Roger. Funny, I was hit upside the head yesterday with this realization…live in the present moment and we can embrace those happy moments. Hi Lori! Thanks for coming along to read and comment! You put it very well. Living in the present makes it possible to appreciate the happy times, however brief, when they appear. I remember laughing during my Mum’s funeral. It’s how we cope. It is, Tilly. We human beings are a strange breed. Please, PLEASE can I visit you at your new workplace? You deserve to stay on the mountaintop for as long as possible, Kate, from what little I know about your past couple of years. I had to read this post this morning when I saw the title, in spite of being too in the days before I submit my book to read anything but my book over and over and over and over and….. I’m so glad I read it. It gave me a little sliver of hope. I should be back to normal by Tuesday, and my visits will resume. I have missed you and all of my other friends in the blogging world. I feel like an electronic hermit. Andra, the next time you are here you must come for a tour. All the best with these last few days of hard work. I know just what you mean: I miss all my blogging mates a huge amount when life in the real world gets busy. Take care, lots of hot chocolate helps for me: a large flask to punctuate the paragraphs. It really is, Nancy. Fleeting, but a real moment of clarity. Dear Kate, what a glorious setting in which to work. And how glorious also that you are caught up in happiness right now, being present to the moment and to the Presence of Oneness. Peace. Thank you Dee. And peace to you too, as always. Working in a puddle on a mountain. You must be deliriously happy! I must remember to look for puddles, not blankets, and get to the mountains much more often. Ha! How many metaphors have I mixed there, PT? But yes. You and me, both. I like the happiness is like a puddle metaphor, very apt. Some days feel like a pool and others a droplet; never know what brings some of it on. Wishing you a pool of happiness today. Thank you, Lou, and you too. This post makes me happy. “Happiness is like puddle” — lovely. Your Mountain looks incredibly tent-pitchable, though I’m guess it’s the Grounds Keeper and not the Creator who’d object. I shall have to make do with my desk looking out of the window on the top floor, Cameron. And a cup of tea and a slice of cake to top it off. If you’re ever in the neighbourhood, naturally, you should come and try some top-floor cake too. Sometimes, an image helps so much in getting one through the blackest moments. Happiness being a puddle, is going to be one of them, for me. Banno, that’s great. I dodn’t explain it really, because I was just writing off the top of my head, but here when it gets really rainy the puddes all join up and it becomes a continuous sheet of shallow water.When my sister was going through a hard time a few years ago we both settled on the fact taht at the heart of the most awful times a sunset could still make us marvel. Debra, I think you are right. It takes a desire to find happiness, which sounds a strange thing to say. Do you remember the ring of dwarves at the very end of the Narnian Chronicles? In The Last Battle, everyone is ordered through the door of the shed which is supposed to contain Tash, the bringer of destruction. But the dwarves believe what they want to believe. Though for everyone else this is the route to the heavenly Narnia, the new world of everlasting hope, the dwarves refuse to see it. They sit in a circle, certain they are in a dark shed waiting for Tash to come and get them, refusing to admit of any other possibility. One has to have an open heart, I think, to see the puddles of joy in each day. Beautifully put, Kate. I do have a 3-year-old clip from my horoscope that I carry around to remind me of this. Every time I want to scoff at the Astrology bunkum, I remember how uncannily accurate star signs are regarding the nature of so many people I know. All that nature and space must be terribly distracting when trying to work. One concentrates so much better surrounded by miles of ugly buildings and with the constant white noise of traffic? I think it would be pretty difficult to focus on working surrounded by such beauty! And what a place it is to work! I’ve come to realise that rocky is normal for many of us – there’s always something. But, somehow, we seem to adapt – quite remarkable, really. Wishing you a road ahead as smooth and inspiring as that wonderful driveway to your work.